Welcome to the AlfaOBD page! AlfaOBD is a software for the diagnostics of the vehicles produced by Fiat Chrysler Automobiles (FCA) group. Fiat / Alfa Romeo / Lancia cars produced in 1994-2017, and Chrysler / Dodge / Ram / Jeep cars of model years 2005-2017 are supported. Although the software is primarily targeted for car owners, it provides many of the features of the professional scanners. AlfaOBD natively supports Electronic Control Units (ECU) installed on the FCA group vehicles. The native support differs AlfaOBD from many other diagnostic applications providing the OBD II generic support which only provides the access to the engine and transmission modules. AlfaOBD is supported on the Windows PC and Android devices. active diagnostics and configuration procedures for various equipment controlled by engine, gearbox, body computer, climate control, ABS, airbag, code control and other ECUs. Service light reset, engine oil change, DPF regeneration and many more. Note: Starting from MY2018 (Fiat 500L from MY2017) FCA installs the Security Gateway Module (SGW) which blocks access to diagnostics for the third-party software. There is no software solution yet, as a workaround please use a hardware bypass module (as an example). 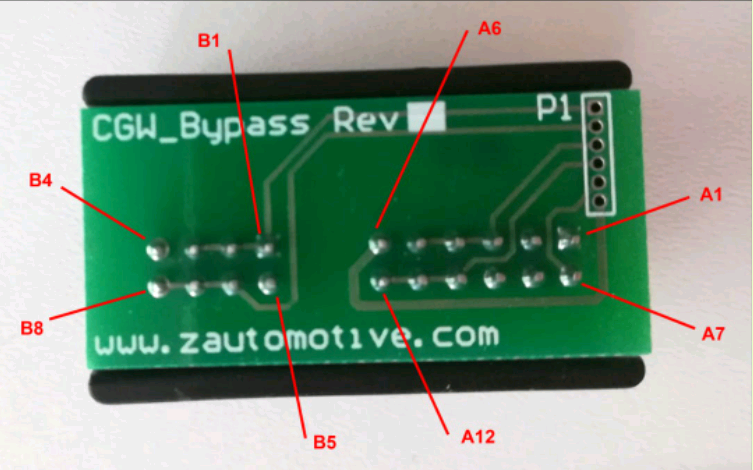 Owners of Alfa Romeo Giulia/Stelvio, Fiat 500X/Toro/Jeep Renegade/Compass (MP) : make sure that the bypass supports the second high-speed CAN bus, the one that is connected to the pins 12 and 13 of the car OBD port. The bypass from Zautomotive does not currently support this bus! Open the Zautomotive device and solder two wires: connect pins A1 and A2, and connect pins A8 and A9 (see the picture). Modification is the same for the first and the second model of the device. OBDLink MX or MX+, LX and SX. OBDLink MX or OBDLink MX+ are the recommended interfaces for the cars with high-speed CAN bus on pins 6 and 14 and the middle-speed CAN bus on the pins 3 and 11 of the OBD plug. These are most of the Chrysler/Dodge/Ram/Jeep cars, PowerNet and CUSW-based, and also Fiat Tipo/Egea. No additional adapters are needed for these cars when using OBDLink MX or MX+. Note: Alfa Romeo Giulia/Stelvio, Fiat 500X/Toro and Jeep Renegade/Compass (MP) require the "grey" adapter for the access to the second high-speed CAN bus. The LX and SX interfaces require "blue" adapter for the access to the middle-speed CAN bus. The OBDLink can also be recommended for the Fiat/Alfa Romeo/Lancia CAN-based cars. The "yellow" adapter is required for the access to the low-speed CAN bus on the pins 1 and 9 od the car OBD plug. 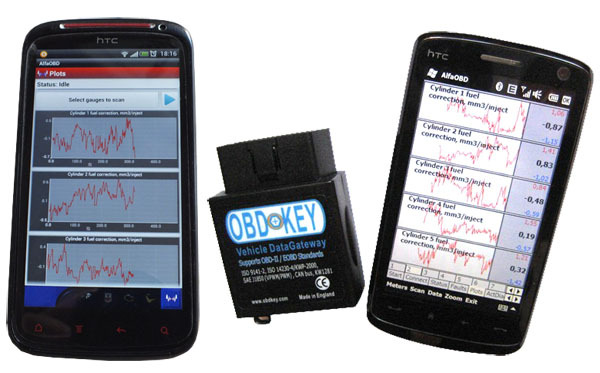 OBDKey Bluetooth/USB/WLAN. This is a universal interface supporting all the control units used in FCA cars. Especially recommended for the non-CAN-based cars. It's a good choice (and the only one under Android) for the cars like Alfa Romeo 145/146/156/166. An ebay interface based on an ELM327 clone might work fine with a bit of luck. But there are lots of defective interfaces sold which can not establish connection to the car ECUs under AlfaOBD. If AlfaOBD displays a message "Interface reports NO DATA" or "Interface reports CAN ERROR" when connecting to the car ECU, this is most probably a sign that you have one of these defective interfaces. Such an interface might work fine with other diagnostic software using OBDII/EOBD protocol, but it can have issues with AlfaOBD because of a different diagnostic protocol used. Kiwi 3 Bluetooth LE (Android only). All CAN units are supported and some of K-Line. The interface features very low power consumption. KLLine USB interface. PC version only due to limitations of Android OS. No CAN support so it is recommended for the non-CAN based cars. For example, interfaces supplied by Electronic-Fuchs.de, Obdauto.fr , and ECUFix.com are supported. Note: USB interfaces are supported on the Android devices via On-The-Go. Check if your Android device has support for On-The-Go and get a corresponding adapter. Note: Some WLAN interfaces have built-in support for Android (like OBDLink MX WiFi), the WLAN connection to the other ones is only available from the Android devices having the ad-hoc Wi-Fi support enabled. Before purchasing a WLAN interface for use with the Android version of AlfaOBD please check if it is possible to configure your particular Android device for the ad-hoc Wi-Fi. Typically it requires that the device to be rooted and the Wi-Fi driver replaced with a modified one. It is recommended to purchase an adapter or set of adapters to be able to communicate to the Control units other than those connected to the pin 7 (K-line) and 6 and 14 (CAN high line) of the car OBD plug. For the detailed description of the features, installation and use of AlfaOBD for Windows see help which is also included into the download packages. The help for the Android version is here (English) or here (German).